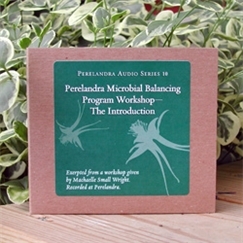 Audio: Microbial Balancing Program Workshop - The Introduction - Perelandra Ltd.
To begin the Microbial Balancing Program Workshop that is on DVD, Machaelle gave an impressive introduction to the world of microbes. As she details their existence and impact, not only within the human body, but in every aspect of the planet since the beginning of time, she helps to open our eyes to these invisible and extremely powerful allies. It’s a great introduction and support for those just getting into the Microbial Balancing Program — as well as for those already working with the program. It provides tremendous support when combined with the Manual.